The name Todi perhaps means "border" (tutere) or "fortified hilltop" (tutus), however, exactly how Todi was founded is unknown. Legend has it that Tutero, chief of the people of the valley of the Tiber, decided to build a village near the river. One day the future Tuderti (inhabitants of Todi) were sitting on a picnic cloth eating, when suddenly an eagle seized the cloth, soared into the sky and then dropped it onto the top of the nearby hill. People considered this to be an omen of the gods and built the town of Todi on top of that hill. History suggests that Todi was founded by the Umbrians in about 2700 BC. Both the Etruscans and then the Romans left traces of their civilization. 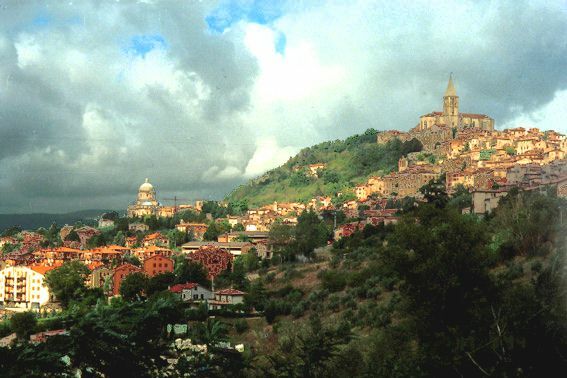 On pre-Roman coins the city is called Tutere. The Romans called it Tuder or Tudertum. It was sacked by Crassus in the Civil War (83 B.C.) and Augustus established a colony here. During the war of the Goths, it withstood Totila during a long and severe siege. The Lombards failed to capture it. Todi and Perugia remained the two chief fortresses defending the passage through the duchy from Rome to the Exarchate. It was included in Pepin's donation to the Holy See. In the 11 C Todi was a republic, and in 1340 its municipal statutes were drawn up by Bartolo. In the Middle Ages, Todi was almost always Ghibelline, and was in constant conflict with Perugia. Boniface IX gave the city to the Malatesta of Rimini, but soon took it back. During the 15 C, Todi often changed rulers - Biondo Michelotti, Pandolfo Malatesta, Francisco Sforza (1434), Piccinino, Gabriello Catalani (Guelph), who was treacherously slain (1475). The city fell into the hands of Giordano Orsini, who was expelled by Cardinal Gillian della Rover (Julius II). In 1503 the Orsini were again expelled, on which occasion the fortress of Gregory IX, reputed impregnable, was destroyed. The Middle Ages marked the beginning of the notorious struggle between Todi and the town of Orvieto and in the 12 C Todi became a free city-state with a much enhanced territory. In 1500, after a long period of decay, the old splendour returned with the artistic forces of Renaissance, a magnificent witness to which is the Temple of the Consolation. Bishop Angelo Cesi promoted this process by patronising numerous beautiful architectural works. Click here for Deruta hotels, vacation rentals and holiday homes. The triple walls of Todi are still easily discerned. The innermost, built of rough grey travertine stone, is Umbrian or Etruscan, the middle wall is Roman, and the outside wall dates from the sixth or seventh century. The Cathedral (11 C) is a Gothic structure showing Lombard influence and built on the site of a Roman building, probably a temple dedicated to Apollo. The current church was almost totally rebuilt after a fire in 1190. The main feature of the squarish façade is the rose-window, added in 1513. The church is in the form of a Latin cross and houses a fresco by Ferraù Faenzone depicting the Universal Judgment - large size rather than artistic merit being its main characteristic. The choir includes the Gothic altar and a magnificent wooden choir-enclosure (1521) with two floors. There is also a 13 C Crucifixion of Umbrian school. The Palazzo del Popolo is a Lombard-Gothic construction from before 1213, and is one of the most ancient communal palaces in Italy. It is composed of two great halls: the "Sala Grande Inferiore" or "Sala delle Pietre" and the "Sala Grande Superiore". The "Captain's Palace", in Italian Gothic style, was built around 1293 and is on two distinct levels. The first floor housed the Justice Hall, with the Judges's offices in the lower. The latter is now occupied by the City Museum and some rooms are frescoed with histories of the city and portraits of its most illustrious men. This palazzo is located in the southern side of the Piazza, facing the Cathedral. It was began in 1293 and later enlarged as seat of the podestà, priors and the Papal governors. The trapezoidal tower was originally lower, and had Guelph merlons. The façade includes a big bronze eagle by Giovanni di Giliaccio (1347). The Palazzo Vescoville is located at the left of the Cathedral and was built in 1593 by Cardinal Angelo Cesi at his own expense. His crest is visible over the great portal, attributed to Vignola. The upper floors include a room frescoed by Faenzone and a gallery frescoed by Andrea Polinori in 1629. The Church of San Fortunato and the sparse ruins of a mediaeval fortress (Rocca) lie on the other crest of the hill on which the city is built. San Fortunato is a Palaeo-Christian temple (7 C) of which two lion sculptures on the entrance portal remain. In 1292, the construction of a new Gothic edifice was begun by the Franciscans. Construction was suspended during the plague of 1348. The lower part of the façade was finished in the second half of the 15 C. The nave and the two aisles have one portal each. These are enriched by fine decorations portraying saints and prophets, with briars representing Good (the vine) and Evil (the fig). The whole apse is occupied by a wooden choir finished in 1590 by Antonio Maffei, from Gubbio. The crypt houses a sepulchre containing the remains of St. Fortunato and other saints, as well as the tomb of Jacopone da Todi. Another noteworthy work of art is a Madonna and Child by Masolino da Panicale. 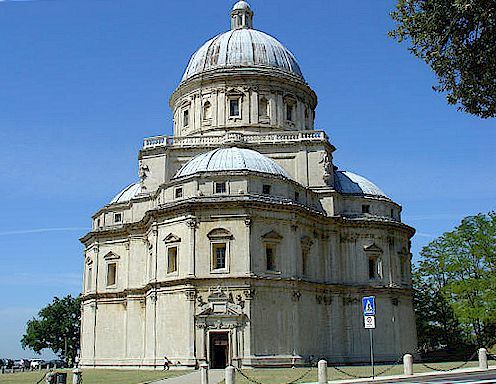 Todi's most striking church is on the flank of the city hill, just outside the walls: the beautifully-sited, domed Renaissance church of Santa Maria della Consolazione (began in 1508), often attributed, although without sufficient reason, to Bramante. It has a Greek cross plan: three apses are polygonal and that on the north side is semicircular. Architects who worked build this church include Cola da Caprarola, Antonio da Sangallo the Younger, Baldassarre Peruzzi, Galeazzo Alessi, Michele Sanmicheli, Vignola and Ippolito Scalza. The church was inaugurated in 1607. The apse is surmounted by a square terrace with four eagles at the corners, from which the dome rises. In the interior, the altar houses a miraculous image of the Madonna, which, according to the tradition, was discovered by a worker during the laying of the foundations. Twelve niches in the first three apses house giant statues of the apostles. Also noteworthy is the wooden statue of Pope Martin I, a native of the Todi area. The most famous Tuderte, Jacopone da Todi, was born in 1326. He was one of the first dialect poets in Italy. Todi is the birthplace of Fra Jacopone, the adversary of Boniface VIII and supposed author of the "Stabat Mater", and of the humanist Antonio Pasini (Antonio de Todi). The city honours several martyrs among its bishops, including St. Terentius, or Terentianus, martyred under Diocletian. Other bishops were: St. Callistus, killed by the Goths, succeeded by Fortunatus, whose body was taken to France; Theophylactus (787), sent by Pope Adrian to England and to the Council of Frankfurt (794); Rustico Brancaleone (1179), several times a papal legate; Rainuccio degli Atti (1326), expelled from the city by the partisans of Nicolas V, the antipope; Andrea degli Atti (1356), the restorer of ecclesiastical discipline; Guglielmo Dallavigna (1405), who tried to induce the antipope Benedict XIII to renounce his claim; Bartolomeo Aglioni (1436), imprisoned during troublesome times; Marcello Sante (1606), who erected the seminary; Carpegno (1638) who promoted study and discipline; Cardinal Ulderico; Cardinal Giambattista Altieri (1643), brother of Clement X, a famous canonist; the brothers Filippo (1709) and Ludovico Gualtieri (1719), who erected a new seminary; Francesco M. Pasini (1760), under whom the restoration of the cathedral was completed. Deruta © ammonet InfoTech 1998 - 2018. All rights reserved.